We're giving away free shred gear all winter. 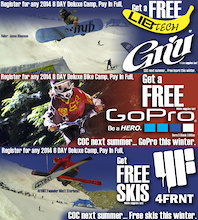 If you'd like a chance to win, head over to The Camp of Champions on Facebook. 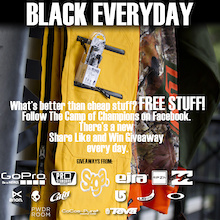 Every day this winter the Camp of Champions is giving something cool away on their Facebook page. Hit it up for your chance to win. Every day there's a new winner and there's a new batch of prizes every day so enter every day. As you have probably noticed from our posts and our Facebook feed, we like nothing better than giving stuff away. Now we are giving away stickers. The Camp of Champions just got another mountain of stickers made and that means it's time to give them away. Hit the link on our blog post or Facebook page and we will send you COC stickers for free, while supplies last. If you want a chance to win Oakley Sunglasses and a RPZN COC Collab hoody, it's never been easier. How To Enter: Go to The Camp of Champions Facebook Page Share the Stoked Camper Six Second Shred Video, Like Camp of Champions, Like Pro Standard Camera Mounts, Like Oakley Canada, Tag three friends in the video. Once you've done the above, post up a comment on the video with your hoody size so that for sure we see your share. Facebook sometimes makes it hard to see your share unless you comment. We will pick the winner tomorrow afternoon. Stay tuned to COC's profile on Facebook and Pinkbike because we will be giving stuff away almost every day all winter. If you want a chance to win an Anon Helmet, Skullcandy Ink'd 2 Earbuds and an RPZN Ski COC Collab hoody, it's never been easier. How To Enter: Go to The Camp of Champions Facebook Page Share the Jenna Blasman Six Second Shred Video, Like Camp of Champions, Like Pro Standard Camera Mounts, Like Cocos Pure Coconut water, Tag three friends in the video. Once you've done the above, post up a comment on the video with your your helmet and hoody size so that for sure we see your share. Facebook sometimes makes it hard to see your share unless you comment. We will pick the winner tomorrow afternoon. Stay tuned to COC's profile on Facebook and Pinkbike because we will be giving stuff away almost every day all winter. Register and pay in full for an 8 Day 2014 Camp and choose one of the free thank you gifts. If you register and pay deposit only, we'll send you a free Dakine COC 25th Anniversary Limited Edition Mission Pack. If you want a chance to win Full Tilt Boots, Skullcandy Crusher headphones and an Eira Ski COC Collab hoody, it's never been easier. How To Enter: Go to The Camp of Champions Facebook Page Share the Tom Wallisch Six Second Shred Video Like Camp of Champions Like Pro Standard Camera Mounts Like Full Tilt Boots Tag three friends in the video Once you've done the above, post up a comment on the video with your your boot size so that for sure we see your share. Facebook sometimes makes it hard to see your share unless you comment. We will pick the winner on Sunday. Stay tuned to COC's profile on Facebook and Pinkbike because we will be giving stuff away almost every day all winter.